Abstract. The main sources of uncertainty in hydrological modelling can be summarized as structural errors, parameter errors, and data errors. Operational modellers are generally more concerned with predictive ability than model errors, and this paper presents a new, simple method to improve predictive ability. 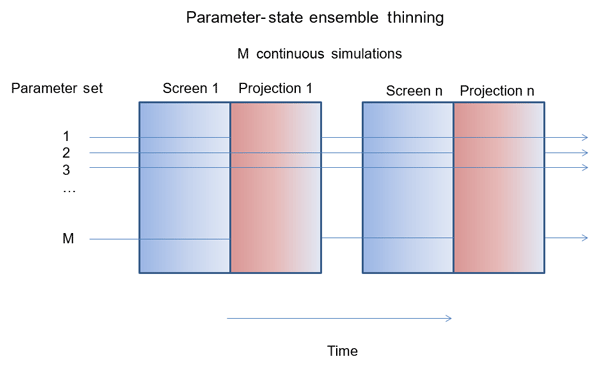 The method is called parameter-state ensemble thinning (P-SET). 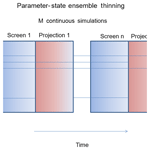 P-SET takes a large ensemble of continuous model runs and applies screening criteria to reduce the size of the ensemble. The goal is to find the most promising parameter-state combinations for analysis during the prediction period. Each prediction period begins with the same large ensemble, but the screening criteria are free to select a different sub-set of simulations for each separate prediction period. The case study is from June to October 2014 for a small (1324 km2) watershed just north of Lake Superior in Ontario, Canada, using a Canadian semi-distributed hydrologic land-surface scheme. The study examines how well the approach works given various levels of certainty in the data, beginning with certainty in the streamflow and precipitation, followed by uncertainty in the streamflow and certainty in the precipitation, and finally uncertainty in both the streamflow and precipitation. The approach is found to work in this case when streamflow and precipitation are fairly certain, while being more challenging to implement in a forecasting scenario where future streamflow and precipitation are much less certain. The main challenge is determined to be related to parametric uncertainty and ideas for overcoming this challenge are discussed. The approach also highlights model structural errors, which are also discussed. How to cite: Davison, B., Fortin, V., Pietroniro, A., Yau, M. K., and Leconte, R.: Parameter-state ensemble thinning for short-term hydrological prediction, Hydrol. Earth Syst. Sci., 23, 741-762, https://doi.org/10.5194/hess-23-741-2019, 2019.